Doug and Bingo return with stories from their trip to New York, SkankFest 2016 and what happened in Tucson. Recorded June 23, 2016 at the Fun House in Bisbee, AZ with Doug Stanhope (@dougstanhope), Chad Shank (@HDFatty), Bingo (@bingobingaman), Floyd (@ArizonaLizards), and Ggreg Chaille (@gregchaille). Produced and Edited by Ggreg Chaille. Closing song, "Danny's Song", by Loggins & Messina. Covered by Michael McDonald on YouTube.com. The kids get thrown out of the announcers booth during a Tucson Saguaro's game. Recorded June 12, 2016 at the Fun House in Bisbee, AZ with Doug Stanhope (@dougstanhope), Chad Shank (@HDFatty), Butters (@Hawk4444), The Anonymous Heckler, and Ggreg Chaille (@gregchaille). Produced and Edited by Ggreg Chaille. Closing song, "The Love Boat", covered by The Mattoid. Day 4, the final day of the Audible recording session. Recorded June 02, 2016 at the Fun House in Bisbee, AZ with Doug Stanhope (@dougstanhope), Chad Shank (@HDFatty), Kristine Levine (@KristineLevine), Bruce from Audible, and Ggreg Chaille (@gregchaille). Produced and Edited by Ggreg Chaille. Closing song, "Swingin' The Alphabet", by The Three Stooges. Watch it on YouTube.com. Day 3 of the Audible recording session. Recorded June 02, 2016 at the Fun House in Bisbee, AZ with Doug Stanhope (@dougstanhope), Chad Shank (@HDFatty), Bruce from Audible, and Ggreg Chaille (@gregchaille). Produced and Edited by Ggreg Chaille. Closing song, "Beware Of Doug", by Henry Phillips (twitter - @Henlips). Available on Soundcloud. A recap of Killer Termite's Day in Bisbee and the Tucson Saguaro's game. Recorded May 29, 2016 at the Fun House in Bisbee, AZ with Doug Stanhope (@dougstanhope), Chad Shank (@HDFatty), Chris O'Connor, and Ggreg Chaille (@gregchaille). Produced and Edited by Ggreg Chaille. Closing song, "Funeral Party", by The Mattoid. Available on iTunes. Stanhope returns from Los Angeles and Chad Shank is back from the brink. Also, the Police Beat with Chad Shank. 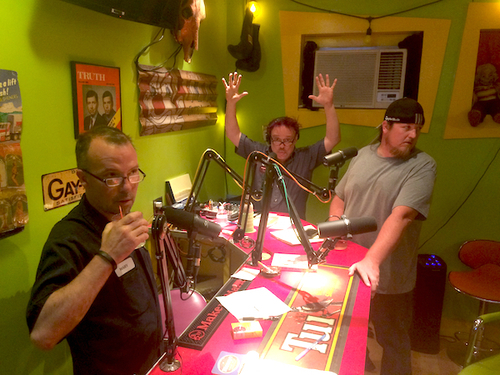 Recorded May 13, 2016 in the Funhouse Studio in Bisbee, AZ with Doug Stanhope (@dougstanhope), Chad Shank (@HDFatty), and Ggreg Chaille (@gregchaille). Produced and Edited by Ggreg Chaille. Closing song, "Mockingbird Hill", by Les Paul and Mary Ford. Available on iTunes.